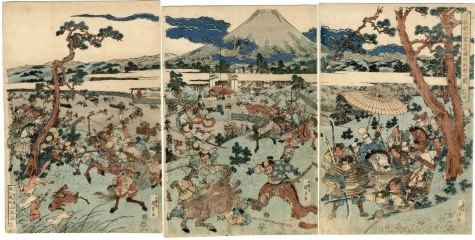 Yoritomo appears on the back of a dappled horse in the right-hand panel. He is protected by both a crowd of warriors, but also by the large yellow umbrella. In the middle panel Nitan-no-Shirō Yadatsune is about to take on the boar. If you use the enlarging tool you will see that in the middle ground of center and left-hand panels there is a fenced off field that is used as a hunting arena where archers are going after deer, foxes and other animals.